Sweet-Scented Snoutbean is a sticky-hairy erect undershrubs. Leaves are alternate, trifoliolate; leaflets up to 8 cm long, pointed, ovate tapering. Flower-cluster-stalks arise in leaf-axils, 2-flowered. Flowers are yellow; bracts usually falling off; Calyx not accrescent, sepals lanceshaped, tapering, nearly equal. Petals are included or protruding. Stamens are diadelphous; anthers uniform. Ovary nearly stalkless, usually 2-rarely 1-ovuled; style long, thread-like, much incurved; stigma capitate. Pod is indented without between the seeds and with a partition within; seeds 2. 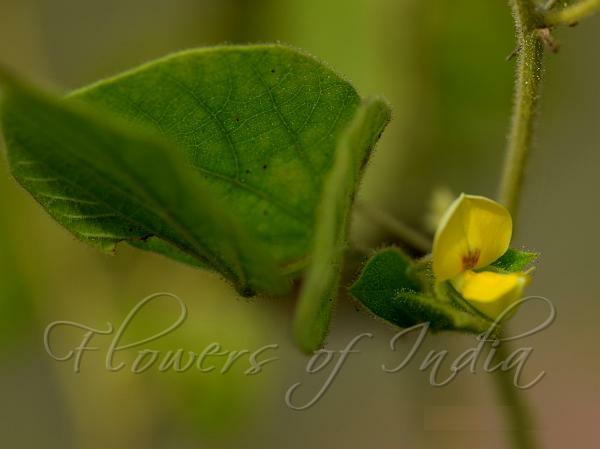 Sweet-Scented Snoutbean is found in South India and Sri Lanka. Flowering: November-December. Identification credit: S. Kasim Photographed at Vellore, Tamil Nadu.